Attractive, but shallow and pointless. ...An abbreviated all-female Gundam minus the drama. The colony world of Omni is rebelling against the tyrannical rule of Earth. The weapon of choice in this war is the loader, basically a walking tank. The Power Dolls are an elite female task force fighting for the revolutionaries. Their mission? Cut off the power to the Earth forces' arms factory by destroying a dam. Based on a series of mecha strategy games, Powerdolls looks great in the preview. The mechs look cool, the action looks impressively explosive, and the characters look... well, okay. But when you sit down and watch this, it strikes you as incredibly pointless. The reason for this is that Powerdolls was made the wrong way. There are two OAVs; I've seen the first and it plays like a miniature movie with miniature plot and minimal characterization. The action, when you watch it in a context other than the preview is actually rather pointless as the mechs never engage in hand-to-hand fighting (in my mind, the best type), it doesn't last very long, and it mostly consists of them standing around firing off stuff at each other. Still, they do look cool, especially when flying. The characters are irrelevant. There is an attempt to do some character conflict, and a bit of rubbish about war morality, but the characters are as shallow as puddles. 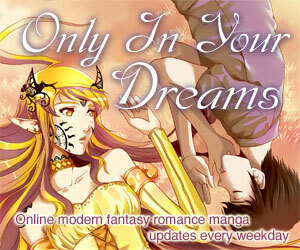 Yao, the main character, is a bit better than most of the rest, but that isn't saying much. Their design is decent. Leave it at that. When I said that Powerdolls had been done wrong, I meant it should have been part of a TV series--this could easily have been one of the middle episodes, in which case all the "pointlessness" would have been irrelevant, or at least the creators could have got away with it better. As it stands, Powerdolls is a waste of your money. Avoid it, unless you are an absolute drooling mecha fanatic. 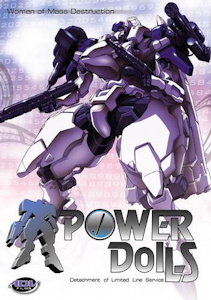 Power Dolls is based on a series of 6 mecha war strategy games (nine, if you include updated versions of each title). The titles have all been Windows games, though the earliest entries in the series also had a few console releases--one for the FM Towns system, another for the PlayStation. All the games have included the English subtitle "Detachment of Limited Line Service"--it's what DoLLS stands for. Available in North America from AD Vision on a single bilingual DVD volume containing both OAVs. Was previously available on two individual subtitled or dubbed VHS volumes. Power Dolls is Copyright © 1996, 1998 Kagado Studio / ARTMIC. Any images are the property of their respective rightsholders, and included for review purposes only under the fair-use clause of US copyright law.